so remember this tutorial?? okay, well I was not very satisfied with the way my t.v just was a HUGE EYESORE on this big white wall. And since, I rent I can't do too much about it. At the time I attempted to re-do the wall with the contact paper, all I had on hand was white, and I didn't want to go out and buy some in another color if it wasn't going to turn out. 2. measured out the lengths on the contact paper. 3. cut the strips, one 1 in wide, and one 1/4 in wide for each side. 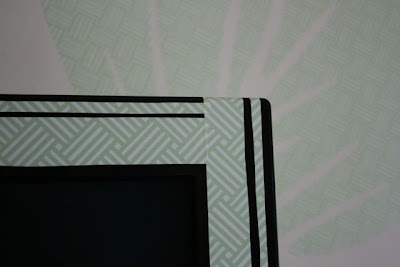 4. applied the contact paper to the t.v. haha - i love this tv tutorial. 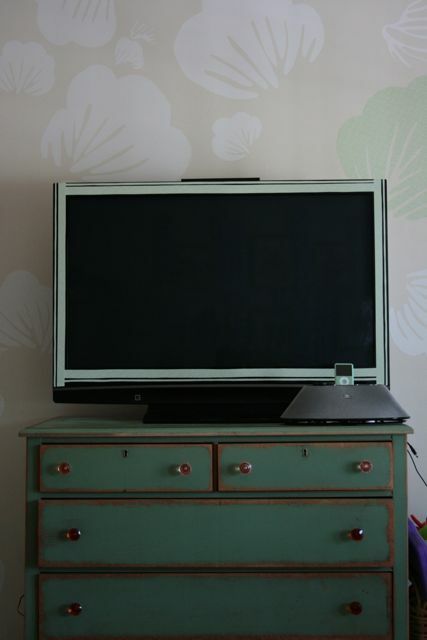 we really wanted a white tv (why don't they make those? all the apple thingys and computers are white now), so one day i took white masking tape and went to town on our tv. it's not the greatest, but it's amazing how it actaully works better now with our mostly white furniture and home. i love the little detail fixes.